This is another rite of passage for every true Austinite. Seeing the Christmas lights on 37th Street is a required holiday activity. When I was in college I always heard about the amazing 37th Street Christmas lights, so I finally decided to see them with my own eyes. The street is lit up from end to end. It’s something deserving of its own segment on the Travel Channel. 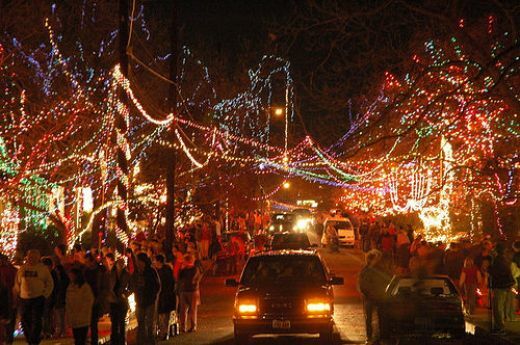 It is truly enchanting, and really represents everything that’s great about Christmas in Austin. It all started more than two decades ago when a resident on the street hung a row of lights across a tree in the front yard and started to add to the display each year. Now lights span as far as the eye can see, covering rooftops, trees, lights poles – I’d pay money to see a picture from space, as I’m sure the magic can be seen from out of this world. I’ve always wondered if there is some sort of contract or mutual agreement signed or acknowledged when a house a sells and a new owner takes over, because this certainly is not for the faint of heart. Seeing it is must! Grab a coat, some hot chocolate and bring your holiday cheer. It’s just another thing keeping Austin weird, and it’s always a great day to be alive in Austin, Texas.